At Lake City Industries, we produce many different types of boat handling equipment, including hydraulic trailers, boat hoists, and boat stands. Each piece of boat handling equipment is designed and manufactured with the customer in mind, and is made of high quality, lasting materials. Boat handling equipment manufactured by Lake City Industries is backed by forty years of experience in the boat handling equipment industry! 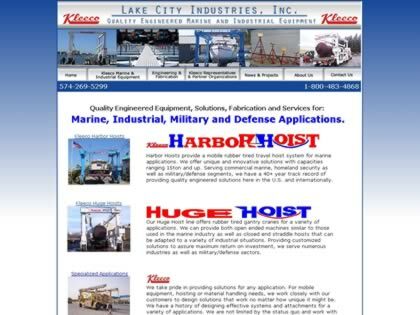 Web Site Snapshot: If available, above is a snapshot of the Mobile Cranes & Hoist web site at http://kleeco-marina-equipment.com as it appeared when this site was added to the directory or last verified. Please Note that Boat Design Net has no involvement with the above web site; all content and images depicted in the above thumbnail are the property and copyright of Mobile Cranes & Hoist unless otherwise noted on that site. Description: At Lake City Industries, we produce many different types of boat handling equipment, including hydraulic trailers, boat hoists, and boat stands. Each piece of boat handling equipment is designed and manufactured with the customer in mind, and is made of high quality, lasting materials. Boat handling equipment manufactured by Lake City Industries is backed by forty years of experience in the boat handling equipment industry!